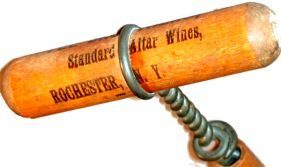 From the Catholic Encyclopedia: "Altar Wine: Wine is one of the two elements absolutely necessary for the sacrifice of the Eucharist. For valid and licit consecration vinum de vite, i.e. the pure juice of the grape naturally and properly fermented, is to be used. Wine made out of raisins, provided that from its colour and taste it may be judged to be pure, may be used. It may be white or red, weak or strong, sweet or dry." 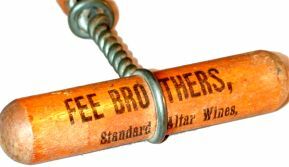 Our featured Clough corkscrew advertises "Fee Brothers, Standard Altar Wines, Rochester, N. 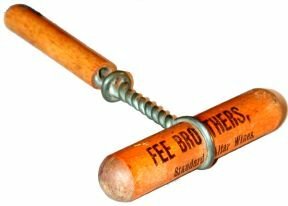 Y." Owen Fee emigrated from Ireland in 1835. By 1847 he was operating a butcher shop in Rochester, New York. Owen died in 1855 and in 1863 the butcher shop was converted into a saloon and delicatessen operated by son James. 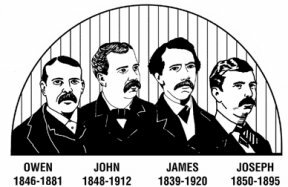 Eventually James' four brothers joined him in the business and developed the company into a winery and import business. The company is still in operation.